Square plate washers are made from low carbon steel and have a larger surface area than round washers. Since they develop more friction when tightened against wood, this type of washer is specified for seismic applications. They are often found in timber construction. Stock sizes are available for bolts from 1/2″ to 1″, with thickness of .195″ up to .395″. 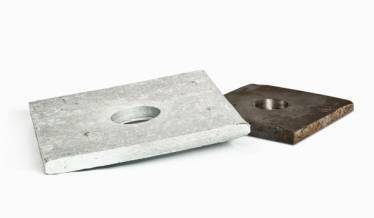 For the best corrosion resistance, hot-dip galvanized plates are recommended. 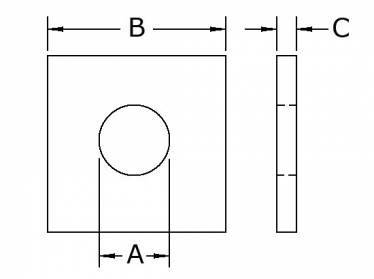 Complete dimensions are provided below. Custom plate washers can be quickly fabricated to meet your requirements.